Testament to the power of gamers to put their money where their hearts are to help people out, the community of free-to-play MMOG Wizard101 raised a combined $126,000 to give to children in need. 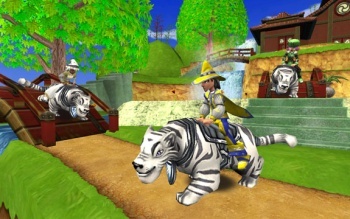 Last month, we reported that Kingsisle Entertainment, maker of free-to-play wizardry-school MMOG Wizard101, had hopped on board the Child's Play train with its in-game Meowmodon mount, a giant rideable tiger that fetched a price of approximately $15 (in real world money). The proceeds were split evenly between Penny Arcade's Child's Play as well as the Austin Children's Shelter, an institution that "provides emergency shelter and care for abused and neglected children," meaning that each charity got $7.50 for each mount sold. By my count, that's a total of 8,400 Meowmodons sold. So eight-and-a-half-thousand young aspiring Wizards are now riding around Wizard City on their Meowmodons while doing their Wizard Training and honing their Wizard skills (or just hanging out and chatting), and they helped support a good cause for doing it. As every MMOG player knows, tiny contributions add up over time. "Wizard101 fans have shown that there truly is strength in numbers," said Elie Akilian, CEO of KingsIsle Entertainment. "We were thrilled to see the Wizard101 community band together to benefit these two great organizations." Nice job, guys. As we say in the MMOG biz, "for the win," indeed.